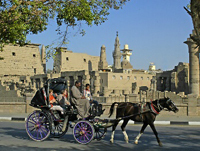 This is ideal for those who want to discover the wonders of Egypt with a visit to Luxor and the bustling capital city of Cairo. Day 1: Fly from Gatwick to Luxor. Transfer to your chosen hotel for a stay of 4 nights. Days 2-4: Opportunity to explore the fascinating sights of Luxor and the surrounding area with a wide range of optional excursions available. Visit the Valley of the Kings the site of Tutankhamen's tomb, the Temple of Hatshepsut and the Valley of the Queens. Take a felucca trip down the Nile or a stroll through the colourful streets of Luxor. Day 5: Fly to Cairo. On arrival, you will be met and transferred to your hotel for a stay of 3 nights. Days 6-7: Time to absorb this bustling and vibrant city. 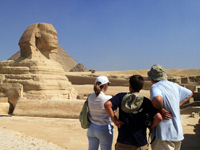 Take advantage of our optional trips as a visit to Cairo would not be complete without a trip to see the Great Pyramids and the Sphinx at Giza plus a visit to the Egyptian museum to see the treasures of Tutankhamen. Day 8: Fly to Luxor and onward flight to UK. Alternatively you could extend your stay in Egypt and spend a week relaxing by the sea in El Gouna.